Iron Overdose is the accidental or intentional consumption of over-the-counter medications or supplements containing iron at higher than the prescribed dosage. Iron Overdose can be particularly serious, if it takes place in children. Iron mineral supplements may be sold under the brand names Feosol, Slow Fe, Fergon, Femiron, or Feostat. What are the Causes of Iron Overdose? What are the Signs and Symptoms of Iron Overdose? The signs and symptoms of Iron Overdose can vary from one individual to another. It may be mild in some and severe in others. Several systems of the body, such as the gastrointestinal system, nervous system, vascular system, lungs and skin may be affected. The symptoms of Iron Overdose may subside after a few hours, but are reported to return after 24 hours. How is First Aid administered for Iron Overdose? Who should administer First Aid for Iron Overdose? 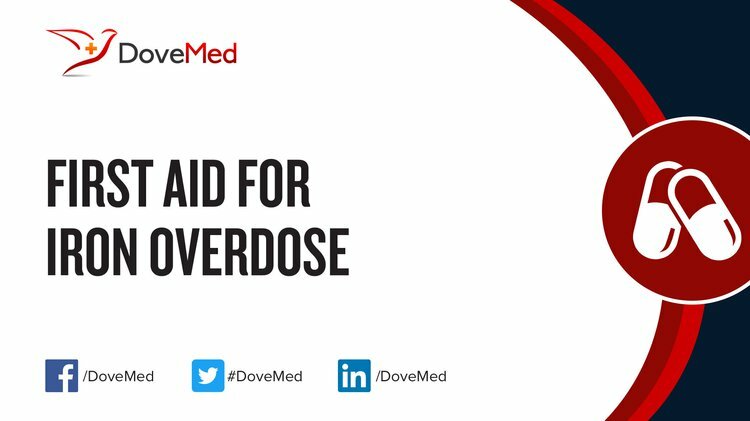 First aid for Iron Overdose is administered by healthcare professionals. What is the Prognosis of Iron Overdose? How can Iron Overdose be Prevented? Milne, C., & Petros, A. (2010). The use of haemofiltration for severe iron overdose. Archives of disease in childhood, 95(6), 482-483. Abhilash, K., Arul, J., & Bala, D. (2013). Fatal overdose of iron tablets in adults. Indian journal of critical care medicine, 17(5), 311. Geraci, M. J., & Heagney, H. (2012). Iron overdose during pregnancy: Case and treatment review. International Journal of Clinical Medicine, 3(7A), 715. Simonse1, E., Valk-Swinkels, C. G. H., Van't Veer, N. E., Ermens, A. A. M., & Veldkamp, E. J. M. (2013). Iron autointoxication in a 16-year-old girl: a protective role for hepcidin?. Annals of clinical biochemistry, 50(1), 76-79. Spanierman, C. S., & Tarabar, A. (2011). Iron toxicity in emergency medicine. Kontoghiorghes, G. J., Kolnagou, A., Peng, C. T., Shah, S. V., & Aessopos, A. (2010). Safety issues of iron chelation therapy in patients with normal range iron stores including thalassaemia, neurodegenerative, renal and infectious diseases. Expert opinion on drug safety, 9(2), 201-206. Gumber, M. R., Kute, V. B., Shah, P. R., Vanikar, A. V., Patel, H. V., Balwani, M. R., ... & Trivedi, H. L. (2013). Successful treatment of severe iron intoxication with gastrointestinal decontamination, deferoxamine, and hemodialysis. Renal failure, 35(5), 729-731. Siu, A. L. (2015). Screening for iron deficiency anemia in young children: USPSTF recommendation statement. Pediatrics, 136(4), 746-752.